Sometimes I need fun. Strange, right? Coming from a balloon lady, you’d think I have fun all the time. But what I actually mean is, sometimes I’m wanting some different kind of fun, something whimsical and something that makes me smile. 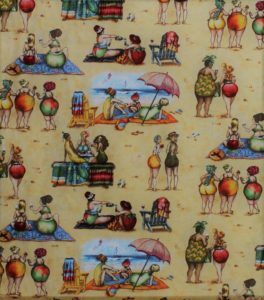 I found this too fun fabric called Fruit Ladies at the Beach and I adore it. Just a bunch of women in various shapes and sizes, together with others, chatting (of course!) and enjoying wine. Look close and guess which scene is my favorite. Well, if you guessed the apple bottom and strawberry bottom sitting on a blanket with apple pouring the wine, that’s it! I hope your day is as colorful and interesting as the conversations these fruit ladies are having!